Colours represent certain emotions, characteristics, values or objects; depending on the context. They act as symbols. In this regards, colours act as the ‘the signifiers’ and ‘the signified’ changes in different cultures. At the deepest level, colours signify either masculine features or feminine features. A large role of determining the gender of an intangible object, like a brand, is played by colours. Here is an attempt to demystify the topic of Brand Gender, through colour symbolism. Colour symbolism can be extremely interesting. Individually a colour could mean something. This meaning changes with the context. A red heart could mean love, a red skull and bone could mean danger, a red cross could mean hospital, a red ribbon could stand for AIDS awareness. When the colour that accompanies red changes, the meaning changes yet again. For most Christians, Red and Green signifies Christmas, for the football fanatics, Red and Yellow, probably signifies the Manchester United logo, and Red and Black in the NBA context, would mean the Chicago Bulls. Delving into a little bit of ancient Indian culture, you see that colours meant a lot even in terms of religion and spirituality. The Trinity- Brahma, the creator, Vishnu, the preserver and Shiva, the destroyer- are represented together with Red, White and Black. The Five Elements, or the Panchabhuta, are also represented thus: Earth- Red, Water- Orange, Fire- Yellow, Air- Green, and Space- Blue. Talking about the Five Colours (Pancharang) it is quite powerful in different philosophies like Egyptian, Chinese, Babylonian, Hindu, Buddhist and Greek. There is a similar set of five colours (the actual colours used in each philosophy differs) representing the basis of the universe. In the Hindu stories, Surya or the Sun God is known as the Saptasvavahana/ Chitrabhanu as the seven horses that draw his chariot are Sveta(white), Rakta(red), Krisna(black), Pita(yellow), Harita(green), Kapisa(grey) and Nila(blue). In Indian classical music, each swara (note) has a specific colour and when in combination with each other, various Ragas (tunes) are created(Samaveda has mentioned the 7 swaras, their respective colours, related god, grahas(planets) etc.). The corresponding colours of these swaras (or notes, the Indian equivalent of Do, Re, Mi…)are as follows: Sa- Green, Ri- Red, Ga- Golden, Ma- White/ Yellowish tint, Pa- Blue, Dha- Yellow, Ni- Multicoloured. According to Bharata’s Natyasastra (Treatise on Performing Arts)- the 8 emotions or the Ashtarasas are symbolised as follows: Sringara (love)- green, Hasya (humour)- white, Karuna (pity)- dove coloured, Raudra (anger)- red, Vira (courage)- wheatish brown, Bhayanaka (fear)- black, Bibhatsa (disgust)- blue and Adbhuta (wonder)- yellow. In ancient Egyptian usage colours broadly had the following meanings: Green was for new life or fertility, Red was for victory(during celebrations they used to paint their bodies red), White for purity (the name of the holy city, Memphis, meant White Walls), Black for death( Osiris the king of afterlife, was known as the black one), Yellow or Gold for eternal (Gold was used during mummy masks and cases), Blue for continuity (The phoenix, a symbol of rebirth was depicted in shades of blue). There are similar, extremely insightful and interesting examples from different ancient cultures. Clearly, colours in the ancient times meant a lot. What about today? Are we losing the meanings behind colours and using colours a tad too frivolously? Looking at the globalized, commercialized, almost kitsch, postmodern canvas that the world is, you see colours smeared across with no apparent meanings. More so in the world of brands. There are very few times when the colour meanings are used with care. A retrospective effort to slap on meanings for the colours used in logos or branding is extremely different from arriving at the values of a brand and the colours they should therefore adopt. Looking around at some of the popular brands, there seem to be an overabundance of red, almost always paired with white or appearing with white on a backdrop of black. Vodafone, CocaCola, Virgin, Adobe, Puma, Levi’s, KFC, Colgate, Honda, Esprit, Pizza Hut, Youtube, Toyota, Marlboro, HSBC, Oracle, Budweiser, Canon, Kellogg’s, Sanyo, Toshiba, LG, Nintendo, Xerox, Nestle, Kitkat, Audi, Reuters, BBC, CNN, Smirnoff, Bacardi, are all popular international brands that have condensed their entire brand identity in logos of red and white. The Communist flag, the Nazi symbol, the Japanese flag, the AIDs awareness symbol, the Red Cross symbol, even Santa Claus come adorned in red and white. Why is Red and White so popular? Why is it a powerful combination? Red and White: A Roman Colour Symbol by Phillip L. Thomas points out how in the Latin literature used red and white metaphors to symbolize life and death. Through blood and bones, roses and milk, roses and bones, poppies and lilies, wine and milk, etc. The Japanese ‘hinomaru’- or the rising sun, is based on the belief by most Japanese that the sun is red in colour. The sun is the basis of all primal energy and is the beginning of the cosmos. Even the national flag is of the hinomaru on a white background. Combinations of red and white signify auspiciousness in the Japanese traditions and white and red strips of cloth are hung during the wedding ceremonies there. The Chinese Yin and Yang principle is one of the classic explanations of the perfect blend of two opposing forces. The Yin Yang symbol is seen either in black and white or in red and white. Yin, the darker element, red in this case, is feminine, passive, associated with valleys, night, the waning moon, slightly negative, etc. Yang, on the other hand, is the brighter element, white, that is active, masculine, positive, associated with day, the hills, the full moon, etc. The Hindu philosophy also offers an explanation on the power of red and white as a combination. Purushais the male principle and Prakriti is the female principle. Purusha is associated with the white of the seminal fluid, therefore male, and Prakriti is associated with the red of the menstrual blood. Like the previous Yin Yang symbol, the Purusha-Prakriti combination is believed to be of supreme significance. The union of the Hindu Gods and Goddesses are represented in caste marks of the Shiva worshippers and the Vishnu worshippers. Shiva and his consort, Parvati are represented by three horizontal white lines and a red dot. Vishnu and his consort, Lakshmi are represented by a white V mark and a red line in the centre. Most Hindu temples have red and white striped walls. What do we learn from these two colours? The fire and potency of human life are symbolized in rituals by the colour red (heat) and control by white (cooling) substances. These two colours, in short, symbolise warm or feminine traits on the one hand, and cool or masculine traits on the other. The perfect blend of these two opposing forces signify a balance, with no skew towards either side. The underlying reason for the widespread usage of complementary colours should also be the same. That a shade of colour from the warm side of the colour wheel balances well with a shade of colour from the cool side of the colour wheel. Dominant Values of a Brand: Masculine or Feminine? The most important exercise for a brand is to determine whether the dominant brand values are masculine or feminine. This determines the choice of colours or the colour palette for the brand. 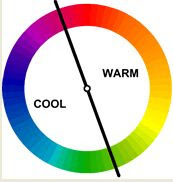 The colour wheel is divided into the cool/ masculine side and the warm/ feminine side. Values that a brand stands for can be mapped onto either side of the colour wheel, depending on whether they are feminine/warm traits or masculine/cool traits. Masculine Traits are Strong, Rough, Muscular, Competitive, Providing, Rational, Aggressive, and Logical while Feminine Traits include Gentle, Sensitive, Soft , Pure, Nurturing, Emotional, and Passive. Masculine and feminine traits could be debated, but there are some values and traits that are broadly agreed upon as falling under one of the two sides. Depending on what the brand custodians agree as the most important values of their brand, this mapping exercise can begin. A larger number of cool traits would imply the selection of more colours from the cool side of the colour wheel or a larger number of warm traits would imply selection of more colours from the warm side of the colour wheel. While we are at the colour analysis of brands, a competition scan based only on colours can also prove helpful. This results in an understanding of the most popularly used colours in this category in your market. This could mean either of two things: these colours are very important in that category therefore we should not disregard them, or there is way too much of these colours, so we should stay away from them. This is a call that needs to be taken after a deeper understanding of the category. Rather than choosing colours randomly from the colour wheel, some logical reasons would make this exercise more robust. For example, if we are in the education business, what are the cultural symbols associated with education in a specific culture? If this is in India, we look at certain age old symbols that go hand in hand with education. • Saraswati is the goddess associated with knowledge, and is represented by the colour white. • The custom of lighting a lamp is a symbol of auspiciousness, and is usually done before you begin any sort of learning. The flame thus becomes a symbol here, and the colours associated with it- yellow, orange or probably gold. • Turmeric is associated with wisdom in ancient Indian traditions. Therefore, the colour yellow. • Saffron is associated with ascetics who are in search of greater wisdom. Therefore, the colour orange. • Another common symbol of learning is the dancing god Shiva, crushing the demon of ignorance, the ‘Apasmara Purusha’. Shiva is depicted either with black or blue. Depending on the brand values and this cultural symbols exercise we arrive at the brand colours of the education business. Brand gender determination is as important as freezing on the brand values and brand personality. Knowing the gender and expressing the same through the most appropriate colour palette makes the brand more congruent with its personality. Colour symbolisms when used carefully could make your brand reach out to your target audience in the most genuine manner. Colours are not there for no rhyme or reason, they are pregnant with meaning, and we as brand custodians should reflect on the colours that exist in our category and more specifically on colours that are right for our brand’s gender mix (dominantly masculine, with a few feminine traits or vice versa). Working with a task based approach to innovation. We all know about products that were launched with extensive consumer research validating them at each stage of the development process, but still failed in the market. Every year, companies spend millions of dollars every year trying to understand customer needs in a bid to innovate and unlock growth. Yet despite the heavy investment in research, and in the actions taken on the basis of the ‘customer needs’ identified, new products fail, advertising and promotion efforts go unheeded and businesses shut down. The problem at the heart of these failures is that too much attention is paid to what customers say they need. In a widely cited article published in 1993 titled “The Voice of the Customer”, Griffith & Hauser advocated listening to “a description, in the customer’s own words, of the benefit that he, she or they want fulfilled by the product or service.” This is typically the approach used by traditional market research. But in the years since then, the staggeringly high failure rate in innovation with these methods (as much as 80% by some estimates) has made it imperative that new models be found that help to understand what customers really need, and use this to guide business strategy and execution. This paper argues for a shift to a more task based approach to customer needs – one where the problems customers are trying to solve in particular contexts forms the focus of the innovation process. This is because for a customer, current products and services are merely solutions that at that time enable them to solve problems, and tomorrow something else may come along to help execute the task in a better way. A transistor radio, a portable cassette player and an MP3 player, for example, all help customers with the task of listening to music while on the go. Different models exist that use this ‘problem - solution’ or ‘task’ based approach to understand customers - for example ‘the jobs to be done model’ introduced by Clayton Christensen & Michael Raynor in The Innovator’s Solution and ‘outcome based innovation' as outlined in ‘What Customers Want’ by Anthony Ulwick. Yet these models, while good on paper, are difficult to adopt. The reason for these difficulties is the lack of clarity that companies have about how to apply the principles to their business problems and market situation. This paper addresses this issue by providing frameworks to make the right choices when using a task based approach. Three kinds of choice situations are examined and directions are proposed. The first is the choice of market research techniques to identify tasks and customers. The second is about choosing which parameters to change when the current business approach is not working well. The third situation looks at the choice of marketing strategies to implement when a product is launched. The aim is to provide a blueprint that will encourage companies to focus on the tasks customers want to fulfill rather than just what they say, thereby increasing the success rate of their innovations and creating differentiated products and services that provide a substantial return on investment. Consider the case of a mobile phone manufacturer. They wanted to strengthen their position in the Indian mass market by creating an innovative new product at a low price point. On asking customers who fit the buyer profile about their unmet needs, they got suggestions along the lines of a better camera, more battery life, better speakers and so on. The company did bring out a range of mobiles with these features – which did reasonably well, but did not have a significant impact on sales. A representative of another mobile phone manufacturer observed the same profile of people when they were using mobile phones. He saw that many of these people had two handsets on which they had inserted SIM cards of two different telecom providers. Typically one handset was on a heavily discounted telecom plan and the other was connected with a telecom provider who gave better network coverage. This led to the idea of Dual Sim mobile phones that carved out a profitable niche for the first movers. Why did listening to what the customers had said lead the company down a blind alley? The answer lies in the fact that when companies gather customer requirements they do not know what types of inputs they need to get from the customer and neither does the customer herself. Wants, needs, benefits, solutions, ideas, desires, demands, specifications (all very different kinds of inputs) can land up as responses to the same kind of questions. Of course it is important to understand what the customer needs. But when capturing customer requirements, managers must look for what customers want to get done, not necessarily their ideas about the product or service itself. For example a razor manufacturer should realize that users who ask for a lubrication strip are really trying to have as few cuts as possible while shaving. A lubrication strip is just one way in which cuts can be minimized. Similarly, razor users may talk about “a wider handle”. But the wider handle may have been requested so that the razor would not slip out of the user’s hand while shaving. If the manufacturer takes this input literally and puts efforts behind creating a wider handle, they may miss out on the fact that a better option to prevent slippage might be a regular-size handle with a ribbed, rubberized grip. Another problem is that the wrong questions or the wrong people get asked, or there may be unrecognized assumptions operating in the design and questions. For instance, Coca-Cola conducted millions of dollars worth of taste tests on New Coke, but didn’t ask whether awareness of the brand changed the drinker’s taste perceptions. Response biases may also be at work. Respondents may decide for themselves what the research is all about and what kinds of answers are “expected”. They may want to unconsciously please or to create trouble for the researcher. Finally, customers may never mention their desires because they assume those desires can't be fulfilled. Often people become so accustomed to the conditions under which they live that they don't even think to ask for new solutions - even if they have real problems that could be addressed. A task based approach overcomes the dependence on the voice of the customer and shifts the focus to more observable and objective ways of identifying customer needs. It creates a shared language that all the internal stakeholders in a company can understand and agree on, helping to create synergy. It also provides a single thread that links and guides effort at different stages of the innovation process. The first decision crossroad arises when companies have a product or product concept in hand, but don’t really know either the tasks the product can fulfill or the customers for whom these tasks are a priority. This situation typically arises when the product has existed for some time in the marketplace, but is not doing as well as it should. Marketers don’t really understand what task this product is being used for and which other tasks could be connected with the product. In this situation some key customers should be tracked down (for example those who have recently increased purchase significantly, bought the product at some inconvenience or have stopped buying) and investigated through ethnography based market research tools. Point of purchase and point of use observations and interviews will need to be combined with these inquiries. The emphasis is on watching the customers and learning from their actions, rather than just asking them. In such a situation, companies are interested in getting a deeper understanding of all the nuances of the task that’s important for the customer, in order to find new ways of positioning and advertising. ‘Generative’ techniques are helpful here. Participating users are asked to make artifacts or fill in scrapbooks with expressive material, which convey meanings about concrete aspects surrounding product use as well as abstract aspects of their life, hopes and fears, and explain them to a panel of peers. Consumers can take photographs or make videos, put together collages, draw and paint or create models of the ideal product. In some unique instances, the company understands the tasks that the product can fulfill for some niche customers, but don’t know what kind of customers would buy it in the mainstream market. Tracking down ‘lead users’ who have modified other products to fulfill a similar task can provide a clue to the larger set of customers who would be interested in the product. In this situation, a promising new technology appears on the horizon, but the manufacturer neither understands which customers to target nor the task it could do for them. In such a case, the company creates a prototype, virtual or physical, and through observation based research (like empathic design techniques) discovers the task it could fulfill for the most lucrative set of customers. In the dynamic and competitive business environment, the strategy with which a company initially approaches or exists in the market often needs to change. In such a situation, a task based approach can be used to inform the choice of parameter to change in the strategy. Often customers use products for tasks that are different from what was originally intended. When it is seen that customers are putting up with inefficiencies because they don’t have a choice, and force fitting the product to their situation, this is an indication to modify the product and tap into a new opportunity. Chinese appliance maker Haier Group discovered that customers in one rural province used its clothes washing machines to do the task of cleaning vegetables. Hearing this, a product manager got company engineers to install wider drain pipes and coarser filters that wouldn’t clog with vegetable peels, and then added pictures of local produce and instructions on how to wash vegetables safely along with the product – a move that helped them win market share in China’s rural provinces. When the real competitors to a product are identified, it often points the way to a change in the marketing approach so that the product can compete more effectively. When the launch of refrigerated entrees, positioned as upscale gourmet dinners, failed, research identified that some customers saw them as a better choice compared to alternatives to lunch at work. Restaurants, fast food, frozen dinners and home - made preparations all had some downside which made even the expensive refrigerated entrees seem like a bargain. This pointed the way to reposition them as office lunches. When a new product launch does not achieve the success that was hoped for, often the root cause is that the targeting is not right. A new venture in jewellery retailing initially targeted women between 18 and 49, but found that most of their buyers were men who saw the chain as useful for selecting a gift but had a highly unsatisfied task of ‘presenting the gift in an interesting way’. The jewellery chain zeroed in on an opportunity to sell men great gifts, by helping them find the perfect way to make a surprise gift presentation. Over time, some brands lose their strong connection to their customers. In such a case, refocusing on the original task the brand promised to fulfill and making it relevant to a new set of customers through a change in the product portfolio can help in making the brand a powerhouse once more. P &G revived Mr Clean by understanding that in the brand’s heyday customers were hiring it to ‘magically’ clean what was thought to be uncleanable. With this insight, they developed a new range of customer value propositions under the brand, like Mr Clean Magic Eraser which worked on surfaces like walls that children had scrawled on or coloured. Another choice framework can be used to make decisions on which marketing strategy to adopt based on how aware people are about the task and the solution to fulfill it. When an entirely new technology hits the market, consumers are not clear what tasks the product will fulfill for them. An effective way to market is to determine what critical tasks the solution could address that consumers are already highly aware of, and then to focus marketing around connecting those tasks in her life to the solution for hire. Direct marketing techniques work well here. Ambient Devices created a set of consumer electronics that gave off lights of different intensity and color based on external conditions and marketed them through products like the Ambient Umbrella. The product indicated when rain was imminent and so fulfilled the task of having an umbrella when it rains. In this scenario, a job exists but is not at the forefront of consumer consciousness. But a great product that addresses that task is out there. The advertising needs to act almost as a ‘wake up jolt’ about the task for people to take notice. Previous to the Listerine advertising, bad breath had been understood as a disagreeable social habit, but because people can’t really smell their own breath, ‘getting rid of my bad breath’ had not been a task they actively sought to fulfill. Before Listerine sold mouthwash, they sold halitosis. In some situations, a product is released into a market where people are visibly frustrated and impatient that an important task they have is not getting satisfied. When the product clearly addresses this high-awareness task, it’s a success from the beginning. In such a situation, word of mouth strategies are very effective. By offering a sophisticated atmosphere and high quality products to customers who had been looking for a ‘third place’ to relax in between work and home, Starbucks were able to create visibly satisfied advocates who spread the word to others. In this scenario, the consumers are highly aware of the task they have and are actively looking out for solutions to fulfill it. But the ability of the product to accomplish the task may not be evident right away. Marketing is therefore vital to bridge that gap of understanding. A story needs to be told about how the product acts and delivers impact on people’s life. Kodak realized that an important task was being able to share images with distant friends and family easily and conveniently and developed Kodak EasyShare. Success was in part due to communication on how simple the process was and how much pleasure it created. The task based approach to innovation has the power to change the world of business as we know it. Companies no longer have to rely on doubtful customer input to make critical investments, or wonder why their innovation failed despite extensive research with customers. The choice frameworks provided in this paper are a clear guiding light to help companies navigate the landscape of customer tasks much more effectively. Making the right choice of research techniques, parameters to change and marketing strategies while utilizing a task based approach will help companies unlock value from their customers and create innovations that change both their own fate and the lives of customers everywhere. Berstell, G. and Nitterhouse, D. (2001). Asking all the right questions: Exploring customer Purchase stories can yield Surprising Insights. Marketing research, 13(3) p. 14 – 20. Christensen, C. M. and Raynor, M.E. (2003). The innovator’s solution. Harvard Business School Press. Griffin, A. and Hauser, J.R. (1993). The voice of the customer. Marketing Science, 12(1), p.1-27. Leonard, D. and Rayport, J.F. (1997). Spark innovation through empathic design. Harvard Business Review, November-December, p.102-113. Ulwick, A.W. (2005). What customers want: using outcome-driven innovation to create breakthrough products and services. McGraw Hill, New York. von Hippel, E. (2006). Democratizing innovation. The MIT Press. "How life has changed. It is a phrase that pops up all the time. In informal catch-ups, in keen-eyed research, in rehearsed presentations. Change is the emphatic, the rhetorical, the catalytic point of so many conversation on and with consumers. We decided to take it up. " With contributions from JWT Planners, Shaziya Khan, JWT Planning, Mumbai, looks at 10 changes each in 10 spaces - Children, Mothers, Health, Food, Finance, Media, Automobile, Technology, Fashion and Travel. Here's the link to Shaziya's takeaways from AdAsia.